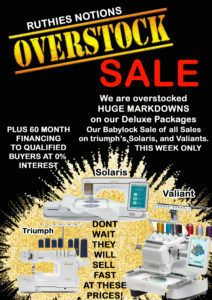 Click the following links to view all of our BABY LOCK MACHINE SALES or our BROTHER MACHINE SALES. Ruthies special message for you and yours today from the Lord. Please read with an open door to your heart so that Jesus can bless you so richly today and always. Click on each image to be taken to the classes page where you can sign up for these amazing classes and see the full details!!! 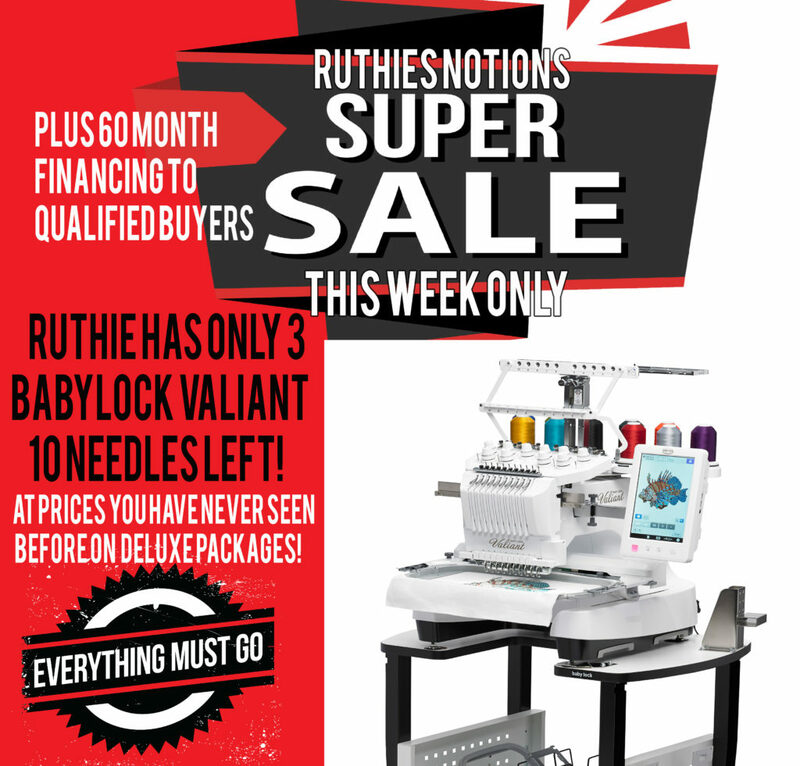 MACHINE SALES at RUTHIE’S NOTIONS!! 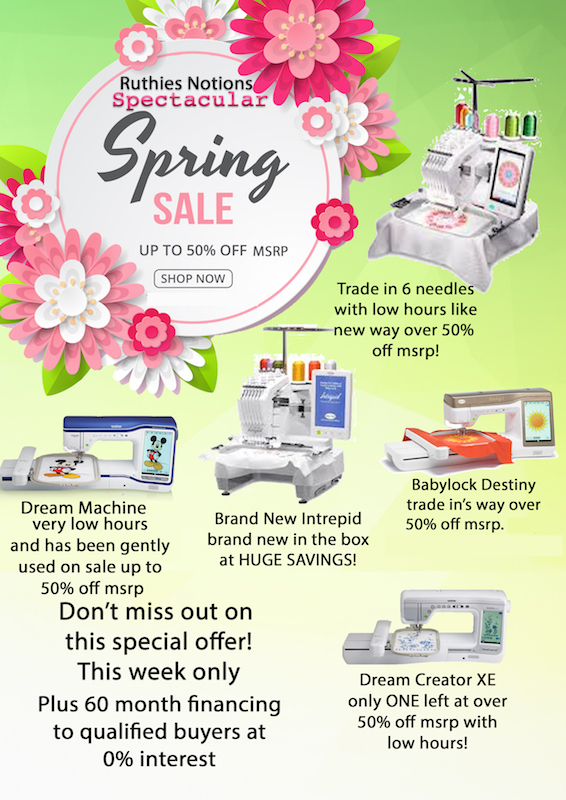 Save now on Baby Lock Intrepid, Destiny, the Brother Dream Machine 2, plus more! 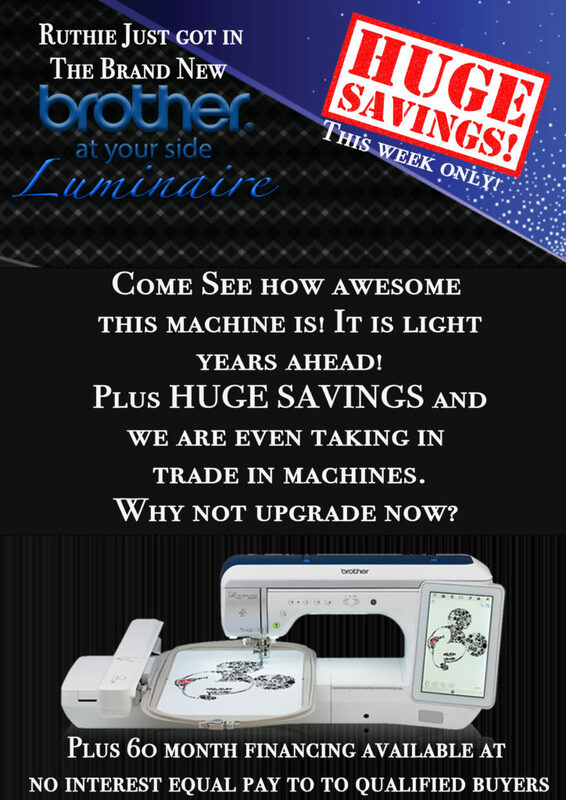 Get the new Brother Luminaire, Baby Lock Solaris and multi-needle machines at the Biggest Discounts Ever!! 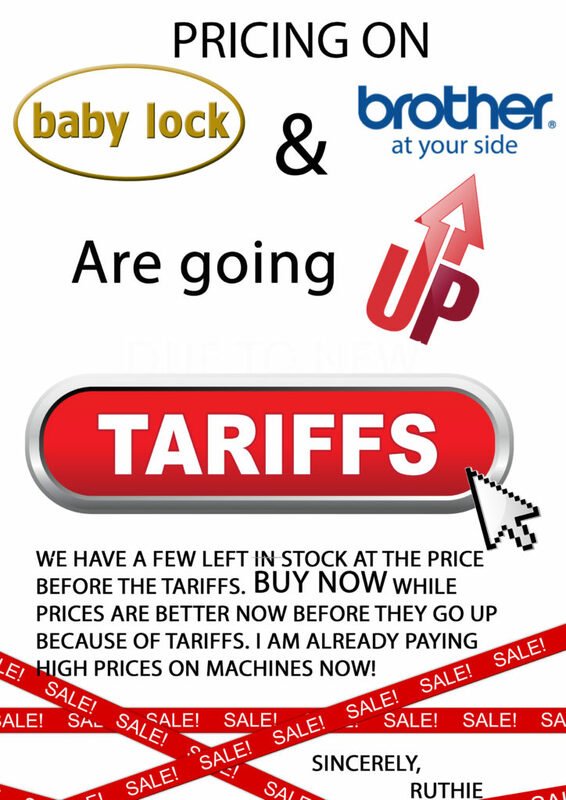 Prices on Babylock and Brother machines are going up because of the new tariffs. We have a few left in stock at the price before the tariffs. BUY NOW while prices are better now before they go up because of tariffs. I am already paying higher prices on machines now! Sincerely, Ruthie. 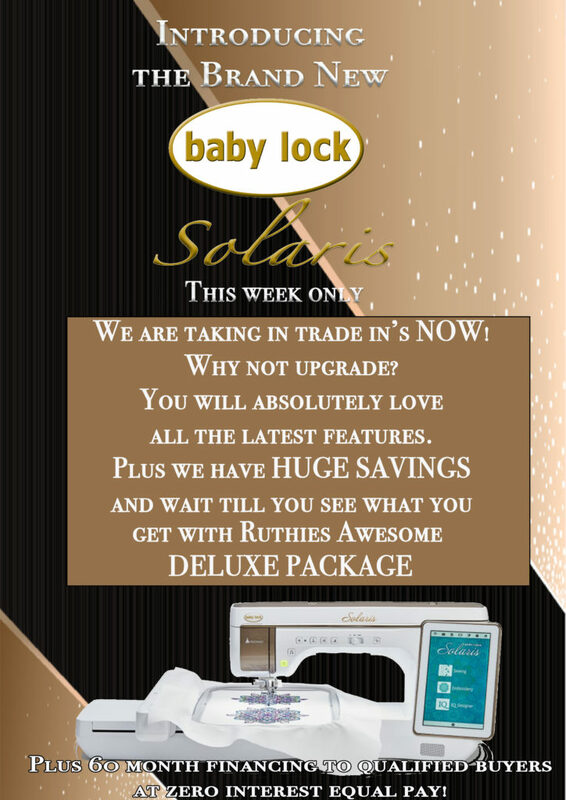 We are pleased to introduce the Solaris: Baby Lock’s new top of the line sewing and embroidery machine. 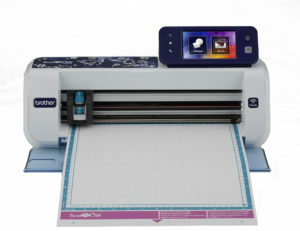 This machine features new IQ Visionary™ projector technology that displays both the design and controls directly on the fabric, letting you see it before you stitch it out. 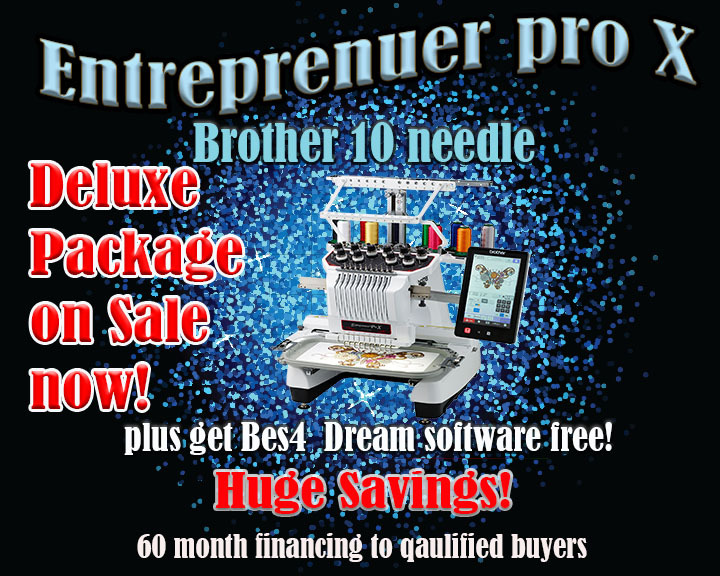 top of the line sewing and embroidery machine. 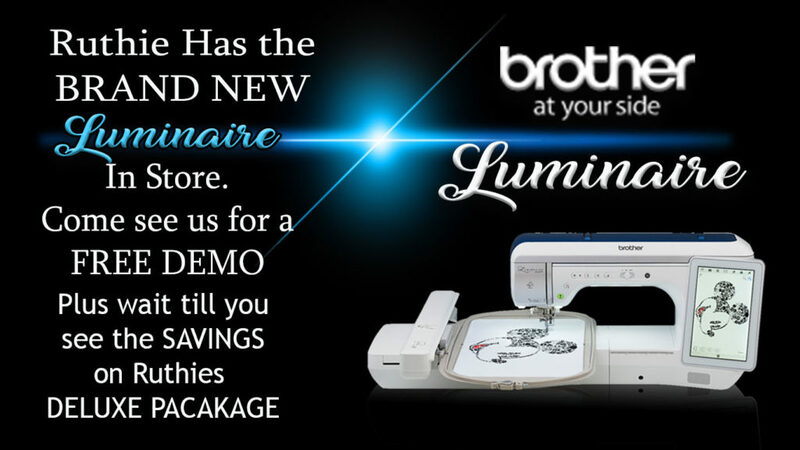 Come see how awesome the Brother Luminaire is plus we have it on sale at huge savings and we are even taking in trade in’s on the latest new Luminaire. While you can still get the best deal now even with a trade in. If you don’t have a trade in you will love the price too! Plus we have 60 months no interest equal pay to qualified buyers too! we are taking trade in’s now. Why not upgrade? 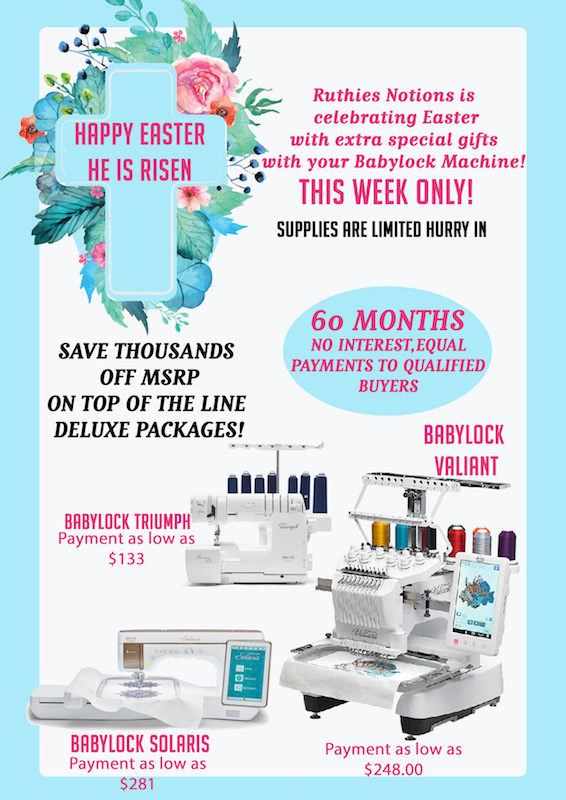 You will absolutely love all the latest features the new Babylock Solaris is light years ahead of any embroidery or sewing machine out there today. 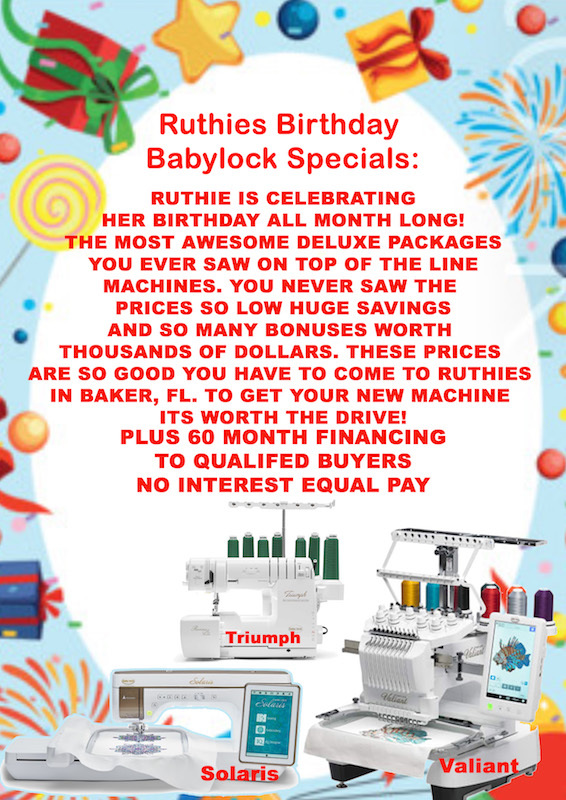 Plus we have Huge savings and wait till you see what you get with it too in our awesome Ruthies deluxe package! 60 month financing available to qualified buyers at zero interest equal pay. 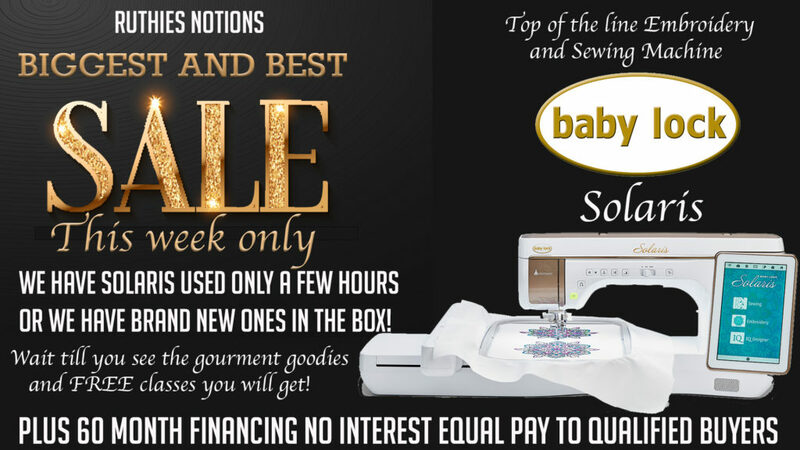 This sale is going on now at Ruthies Notions. 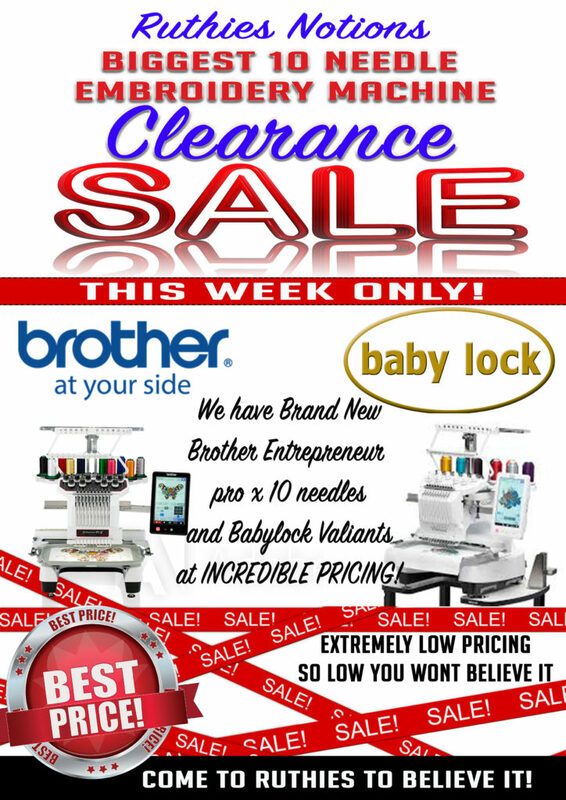 I have some brand new Brother Entrepreneur Pro x 10 needles and Babylock Valiant 10 needles at INCREDIBLE PRICING! BEST PRICING EVER! SUMMER CLEARANCE SALE PRICES SO LOW YOU WONT BELIEVE IT. COME TO RUTHIES STORE TO BELIEVE IT! 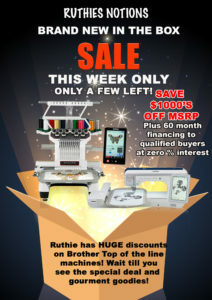 We got HUGE SAVINGS on Brand new in the box Brother Entrepreneur pro x, Dream Machine 2, Destiny 2, and triumph sergers. 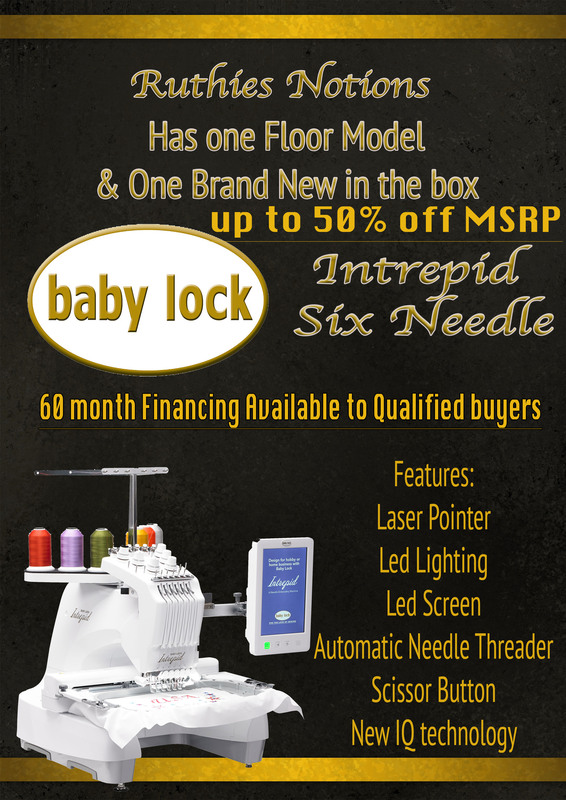 Plus Babylock 6 needle intreprids. Awesome financing available at 60 months to qualified buyers zero interest equal pay. Wait till you see the prices of floor models! 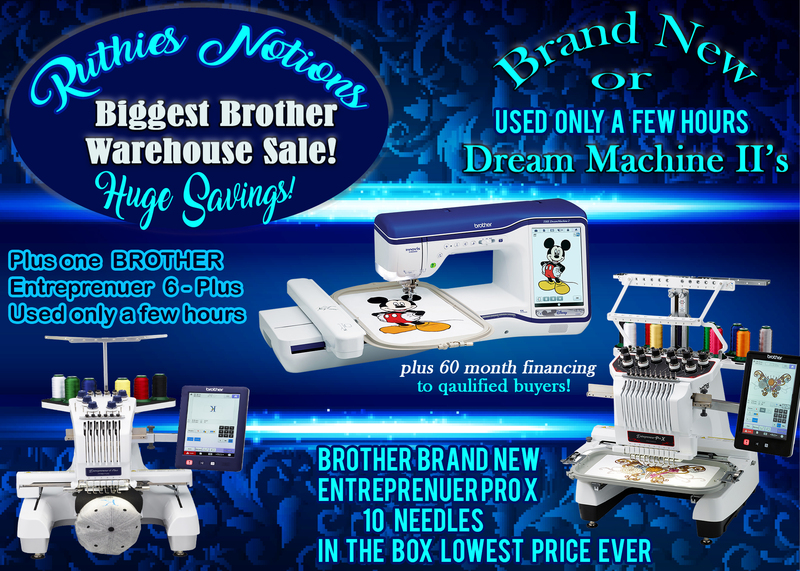 Plus a Brother Dream Creator XE at the lowest price ever! 60 Month Financing to qualified buyers. This Week Only! Traded in Machines VERY RARE OPPORTUNITY! 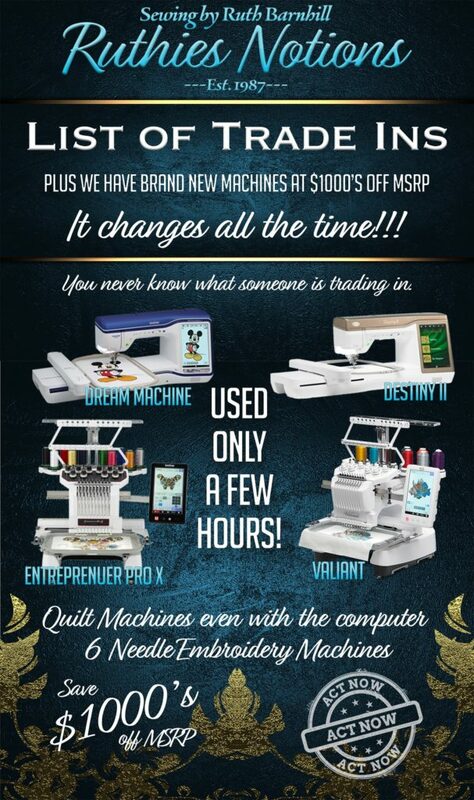 They all have been used gently used only a few hours Select traded in machines are even up tp 50% off MSRP. They wont last long hurry in to Ruthies today before they are gone. 60 month financing available to qualified buyers! 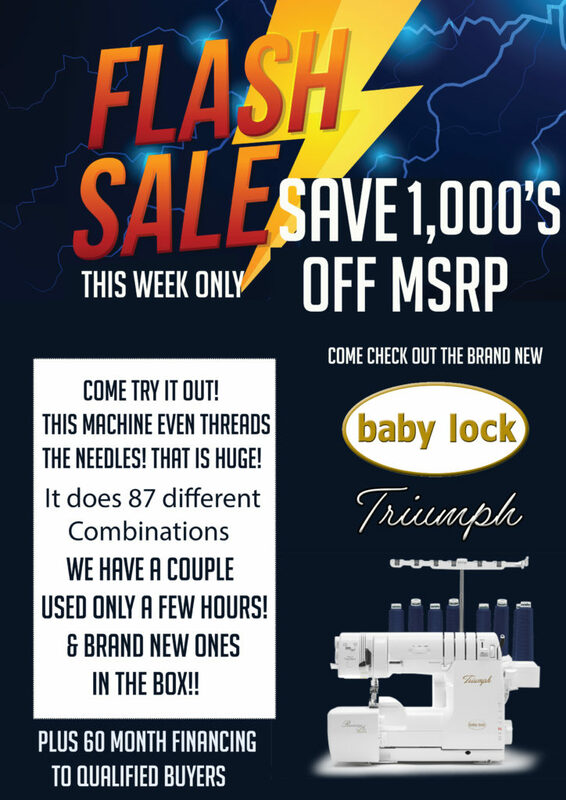 Buy a Destiny II at MSRP and get a brand new Baby Lock Triumph for FREE!! 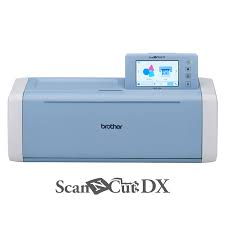 Ruthie has the Brand New Brother Scan N Cut DX on special THIS WEEK ONLY! Don’t miss out on the great deal! 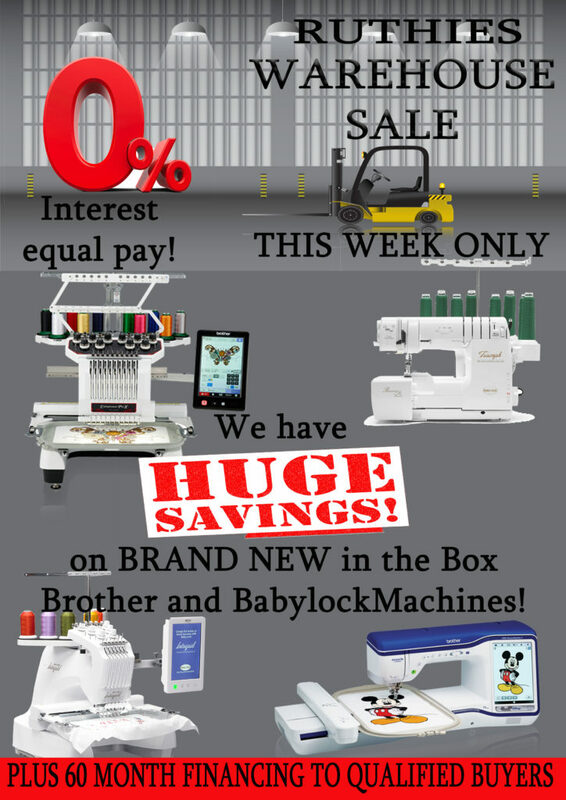 Click the following links to learn more about all of our Brother Machine Specials and our Baby Lock Machine Specials!! 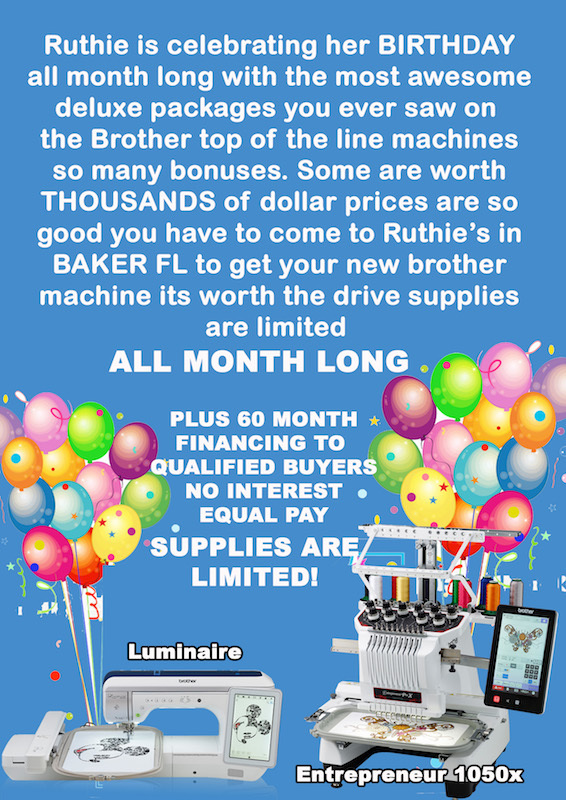 Ruthie’s Notions in Baker Florida, is offering the most awesome classes ever offered anywhere in the whole USA. 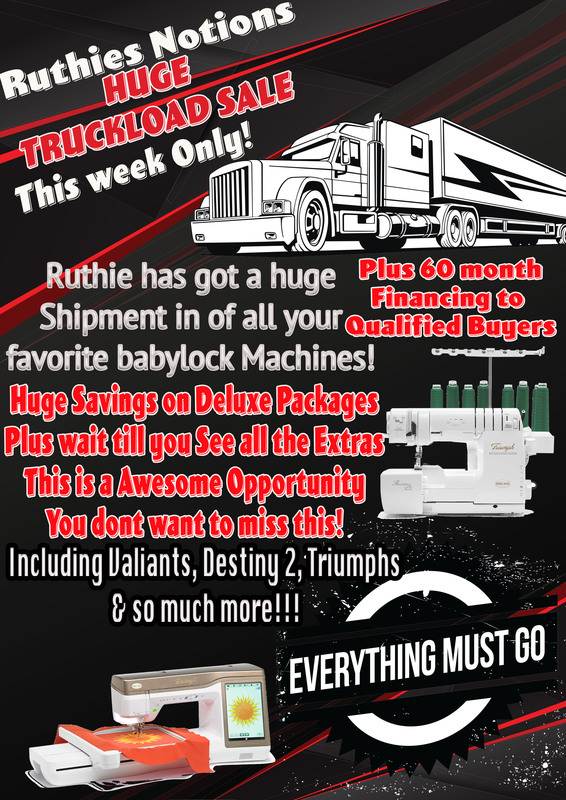 Buy your machines at Ruthie’s – when you see what all we throw in with your machine along with our awesome bundles you will be so blessed. Come see for yourself – you will be so glad you did! Ask our customers that love Ruthie’s! 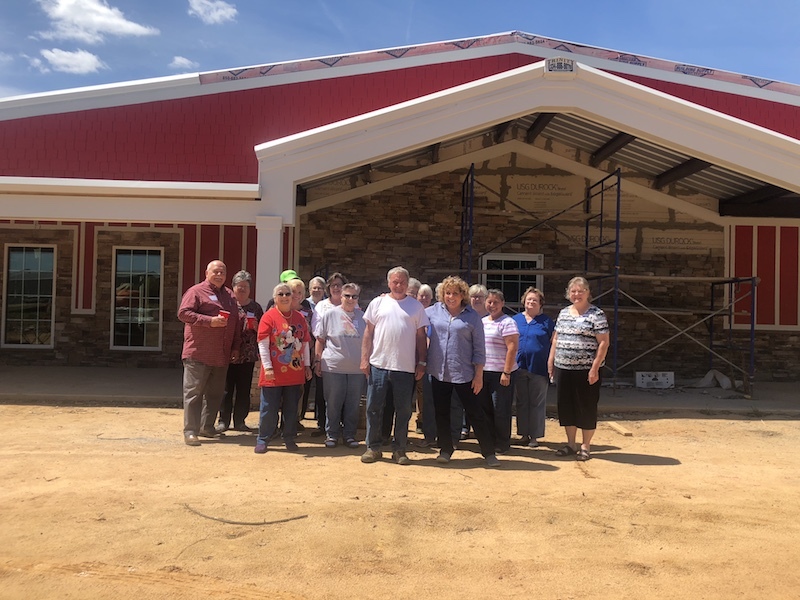 Wait until you see our awesome brand new event center that will be opening up very soon. We will let you know when the doors will open. It will not be much longer. It is such a precious gift from God we are so thankful what the Lord is doing to help us have a blessed place for you and your loved ones and friends. Come and be blessed with some of the most awesome classes and events in the country today! Even if you have a vinyl business, you can add so much to it! We will help you with classes and training with the best teachers in the industry today! We have a multitude of customers who have very successful businesses. Wait until you start coming to Ruthies and be blessed beyond measure. Praise the Lord!! 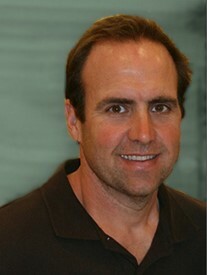 David Barnhill, Ruthie’s son, is a trained Baby Lock Technician. Servicing Baby Lock machines on a regular basis will help keep them running right and at their best potential possible. If you are having problems with your Brother or Baby Lock machines contact us to help get them back up and running correctly! #1 Baby Lock Dealer for the USA for a single location for 2016 at Baby Lock Tech this year. 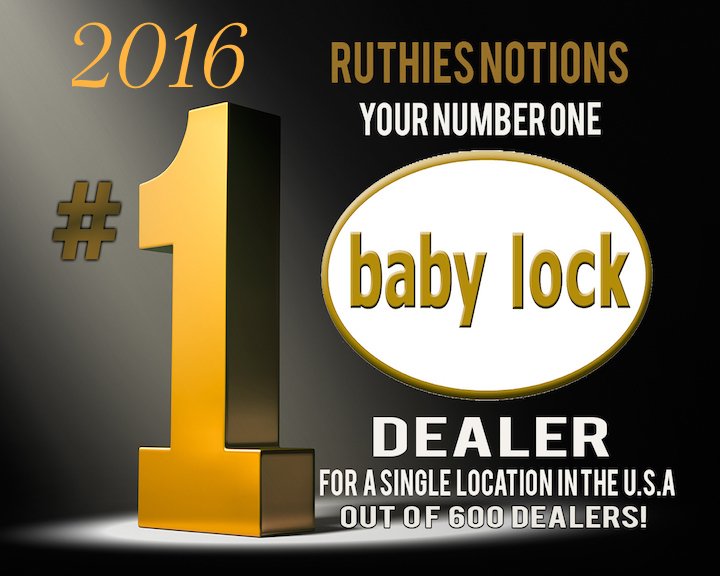 Ruthie’s Notions is the #1 Baby Lock Dealer in the USA for 2016. 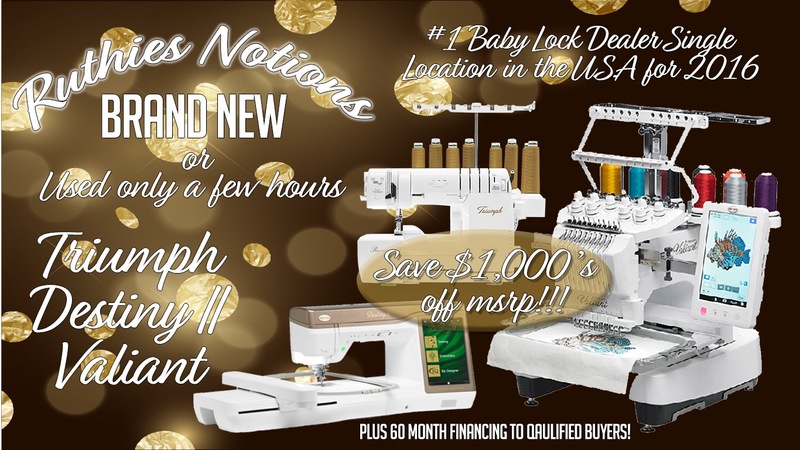 We offer the complete line of the most wonderful Baby Lock machines at huge savings. Plus, we have the most free classes and training you can get anywhere in the USA. 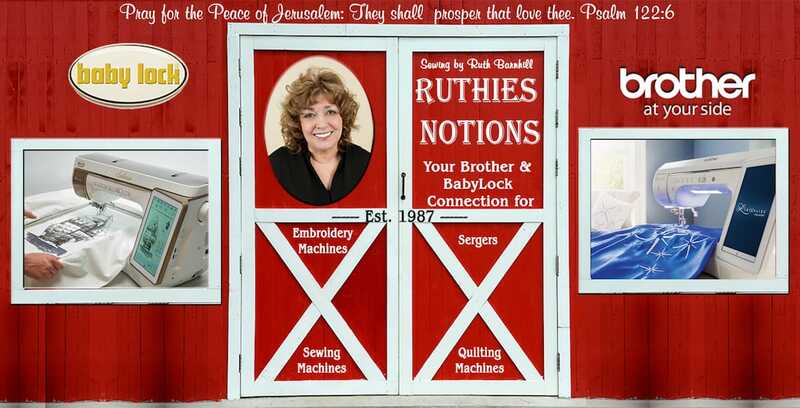 Why not come to Ruthie’s Notions in Baker FL and experience it for yourself! 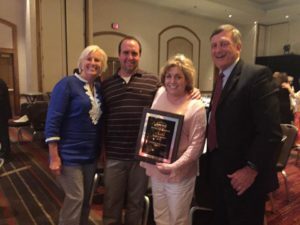 We have been in business for over 30 years and top in sales for years! We have so many customers that come to Ruthie’s from all over the USA! At Ruthies Notions in Baker FL, just 4 miles from the only red light in town, you will wonder if you will ever get there. But when you do, you will be sooo glad that you did. Nobody takes care of you like we do. Some places will not even give you a pack of needles when you buy your new or used machines. We do!! We give you the works so you can go home and start embroidering and sewing away. Plus we don’t only give you all the gourmet goodies to get you started, we offer the best classes in the world at Ruthies Notions. Most of our classes are FREE. 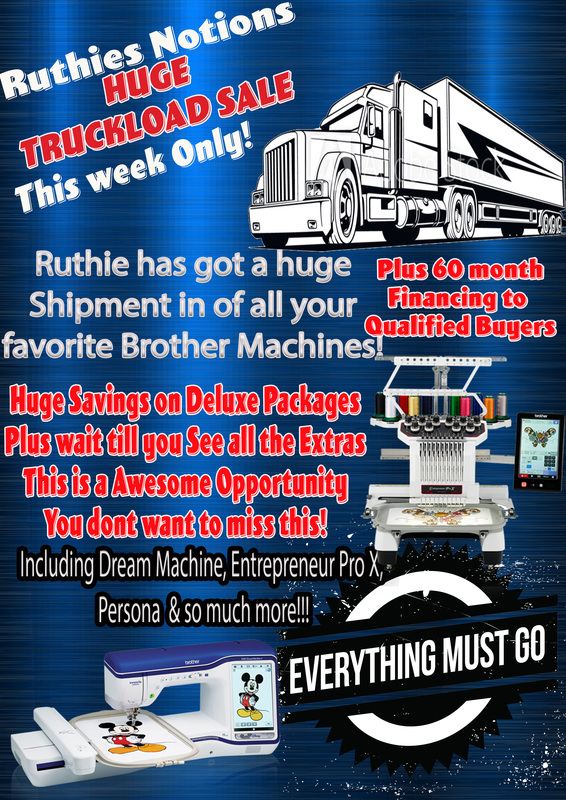 People, fly and drive from all over the US to buy their machines from Ruthies Notions. We carry Brother and Babylock machines. Our machines, plus all the incredible extras you need and classes to teach you how to use them. Get the most bang for your buck at Ruthies. We take it really seriously at Ruthies Notions and offer the best Make It and Take It classes. We bring in teachers from all over the WORLD (seriously) to teach our classes. 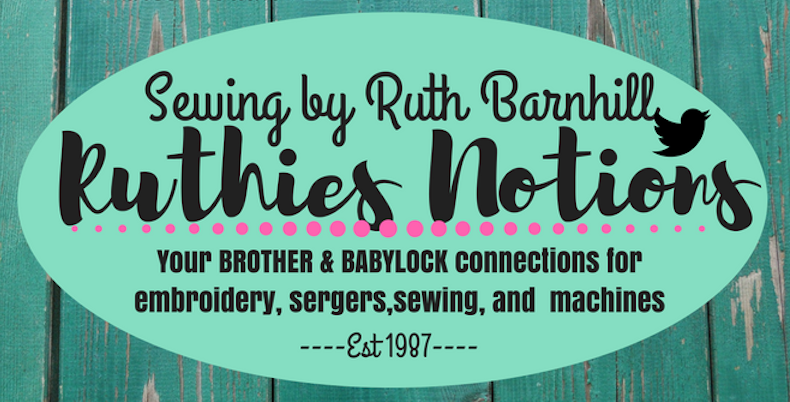 Come to Ruthies today and get started on a brand new adventure in embroidery, sewing, quilting and serging. It’s beyond anything you ever imagined. Creativity with embroidery and sewing – the possibilities are unlimited. Many people start businesses or add to their existing business. 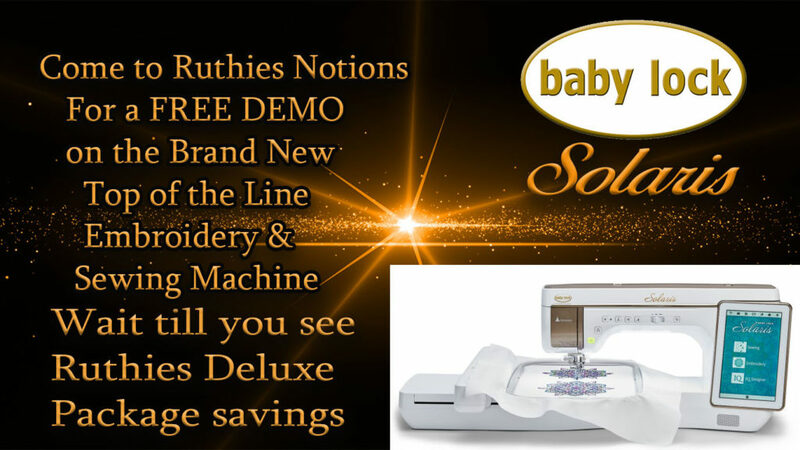 You would not believe how many of our customers have started very successful businesses with the machines they purchased at Ruthies Notions in Baker, FL. Hope to see you real soon and may the Lord Jesus bless you and yours beyond words forever. Amen! 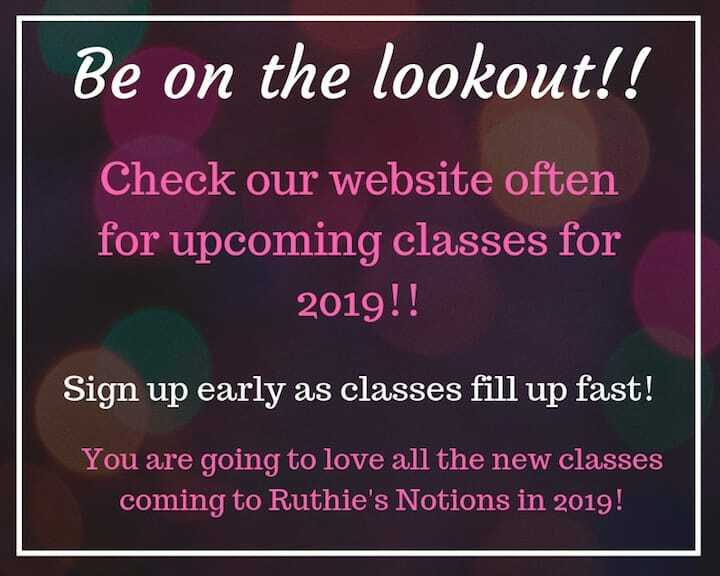 Ruthies Notions in Baker FL has awesome classes planned for 2019! Visit our classes page often to see what all we have going on for you and yours! It’s never a dull moment around Ruthies with all the new Make It and Take It classes as well as Lecture Demo classes! We only list classes a few months in advance so sign up early! So many classes are out of this world wonderful! Just ask all the people who come!! To sign up for any of our classes simply visit our classes page to view all of our classes!! 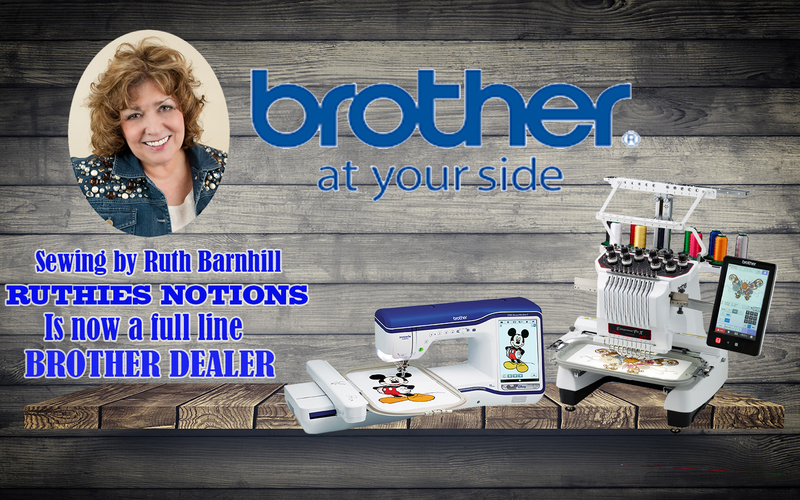 Ruthies Notions is now a FULL LINE BROTHER DEALER!!! We have the very best prices you ever saw. Plus – no-one else gives you all the goodies we do plus the excellent training and classes that we offer. 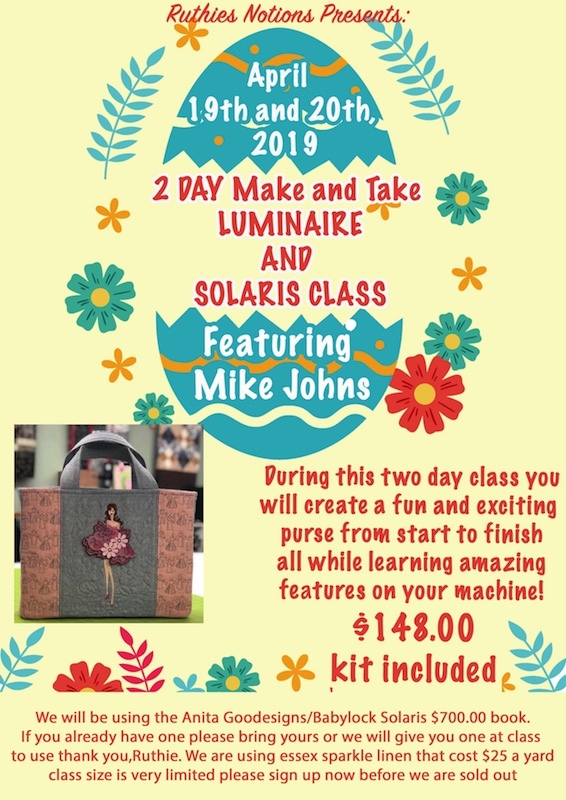 You can go home and start sewing or embroidering right away! 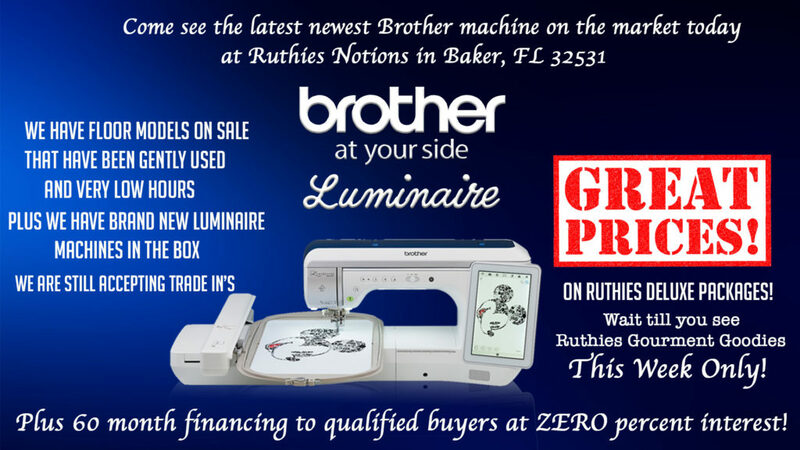 Check out our available Brother machines. We offer awesome financing (to qualified buyers)!! Hurry in today!! Don’t miss all our special prices going on NOW!!! 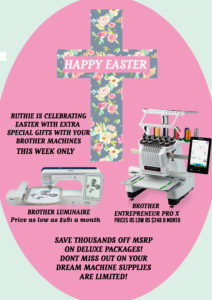 Click here for our Brother Machine Sales and Specials. At Ruthie’s Notions we would love to help you customize the awesome Baby Lock or Brother package of your dreams. 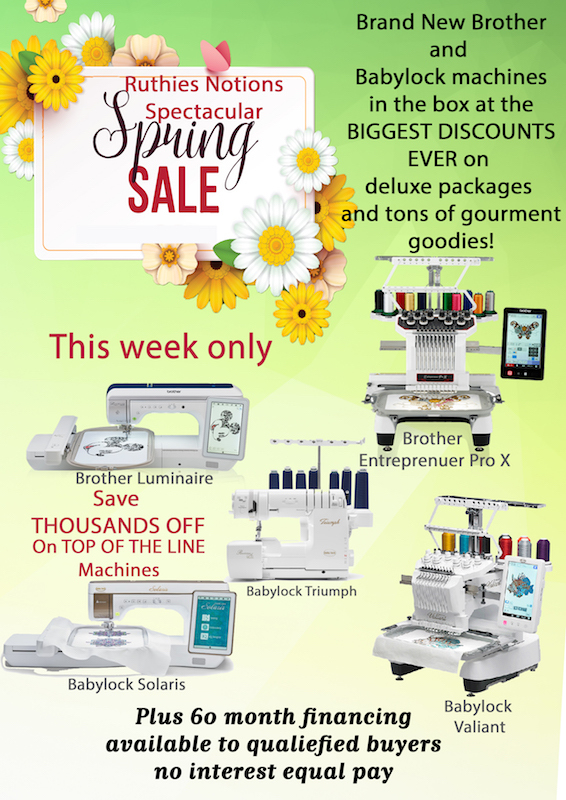 We specialize in Brother and Baby Lock Embroidery, Sewing, Quilting Machine and Sergers. Each person has different needs. Some people have worked hard all their life. They are ready to enjoy sewing and embroidery to its fullest potential. We are a Brother and High Performance Baby Lock Platinum Dealer, and #1 Baby Lock Retailer, Single Location, for over 5 years in a row! We have some of the most creative and educational classes you have ever attended anywhere. You will absolutely love all the classes we have planned for you and yours this year! Each one is quite different and exciting. Our customers love them. We are here to help you learn how to use your machines and make beautiful things with them. Located in Baker FL., we are not that far from Crestview, Fort Walton Beach, Destin, or even Panama City! We also have many people come from Niceville, Pensacola, Andalusia, AL, and Montgomery, AL. If you are planning to start a business or already have one, we offer some of the best classes out there to start a business. We will provide a ton of ideas to get you started right. You would not believe all our customers who have started successful businesses of their own! To view all of our upcoming Brother and Baby Lock classes CLICK HERE.